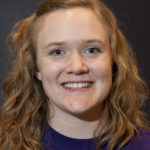 Sara Hahn decided to go to Truman State University for a number of reasons ̶ the location and size of the institution, her first impression of the students, Truman’s reputation for a great education, and the reasonable price. She also found mentors to help guide her and tremendous access to learning opportunities that connected what she learned in the classroom with the real world and helped define her career path. Sara liked the location in Kirksville, Mo., because it was only a 3.5 hour drive from her hometown of Saint Louis. “Close enough that I could go home for a weekend if I needed to but far enough that I felt I’d get the full ‘college experience’ away from home,” says Sara. She also liked Truman’s smaller-size classes which meant not only would her professors know her by name, it would also make it easy to develop close relationships with both her teachers and her peers. This was confirmed when she visited campus for the first time — the warm welcome of the tour guide and the smiles from the students walking around made her feel right at home. Sara decided to pursue studies in communication disorders after having a discussion with Janet Gooch, dean of the Health Sciences and Education Department at Truman. “She informed me that this field is crucial for helping those with speech, language, and hearing difficulties — all topics of importance to me,” says Sara. “As an undergraduate, completing 25 hours of observation in the Truman State University Speech and Hearing Clinic allowed for my observation of clients ranging from preschool age to elderly adult age with a variety of disorders: articulation disorders, voice disorders, phonological disorders, language disorders, and auditory disorders, to name a few,” says Sara, who enjoyed observing and working with clients who have autism spectrum disorders. The experience also piqued her interest in acquired language disorders — communication difficulties caused by traumatic brain injuries, neurological diseases, or strokes. Sara discovered lots of opportunities for student involvement outside of academics which allowed her to engage with students from a variety of different majors and to participate in service on and off campus. As an undergraduate student she was involved with Alpha Phi Omega, a service organization, and the Sigma Kappa sorority. One of her most memorable experiences was taking part in the Big Event, a day of service in which Truman students gather together to assist members of the Kirksville community. “It was great to see so many fellow students out and around the community in the spirit of service and to have fun doing it!” says Sara. Sara believes that the liberal arts and sciences education offered at Truman allowed her to pursue her passion to improve the lives of others along with the opportunity to explore a variety of perspectives and fields which she may not have had a chance to learn about had she attended a non-liberal-arts school. “I was able to explore topics which I knew virtually nothing about, such as philosophy and religion, Spanish, and psychology, which will be beneficial in my career in furthering my understanding of clients who have cultures different than my own,” says Sara. She already has a bachelor’s degree in communication disorders under her belt, and once she has earned her master’s degree, Sara plans to become a speech-language pathologist in a school or a hospital.